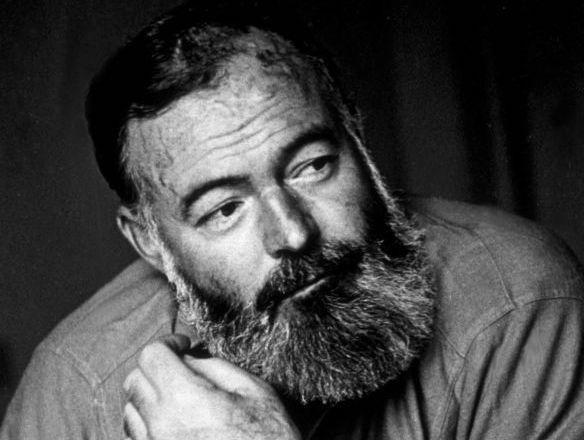 Returning To Hemingway: The Books We Come Back To And The Books We Forget Lynn Neary considers her forgotten Hemingway period and asks what books you mean to return to and which ones you already have. American writer and war correspondent Ernest Hemingway (seen here in July 1944) has inspired Lynn Neary to think about the books she wants to read again. What are yours? There was a time in my distant youth when I was trying to "find myself." I supported this endeavor by waitressing, and that meant I had time to spare during the day. I won't lie: I wasted many an afternoon during this period of my life. But I also think of it as my "Russian period," the only time in my life I could immerse myself for hours in the world of Russian novels with complete abandon. I charged through Dostoeyevsky: Crime and Punishment, The Brothers Karamazov, The Idiot. I got lost in Anna Karenina and even accomplished that great literary feat: reading all of War and Peace. I loved them all. And yet, if you asked me today to tell you the details of their plots or name their major characters, I would be at a loss. The truth is, I need to read them again. I was reminded of this sad fact of life recently when I read Paula McClain's new novel The Paris Wife, a fictional account of Ernest Hemingway's first marriage to Hadley Richardson. I don't remember exactly when I went through my Hemingway period, but it seems to me now that I read everything he wrote. I was so taken with his fictional accounts of bullfighting that I even read Death In The Afternoon, his book of essays on the beauty of this bloody sport. I am not sure how long my love affair with Hemingway lasted, but I know that as I grew older, I turned against him. He was too macho, too arrogant, too taken with himself. I found other writers to love. But The Paris Wife reawakened my interest in Hemingway. I found myself flipping through A Moveable Feast, searching the internet for more information about the young Hemingways in Paris and, of course, trying to remember the Hemingway books I have read. I know that as a young woman, I was utterly taken by the story of love in the midst of war in For Whom The Bell Tolls and the epic battle of The Old Man And The Sea left a lasting impression. But the details of The Sun Also Rises, the book Hemingway wrote while still married to Hadley, are long gone. So add Hemingway to the list of books that need to be reread. But when? Before or after all the books I have not read even once but fully intend to get to before I die? A while back on this site, we wrote about our Shelf Of Constant Reproach, those books we all think we should have read, but are ashamed to admit we haven't. Well, here's a whole new challenge: What are the books you've already read, but feel you need to return to someday? And what books were better, or worse, the second time around?